Once a working hacienda, it has been renovated and turned into a luxury hotel but you can also come here just for a tour or lunch. We did just that when we visited with my husband in May 2018. Our lunch was exquisite, I must admit. 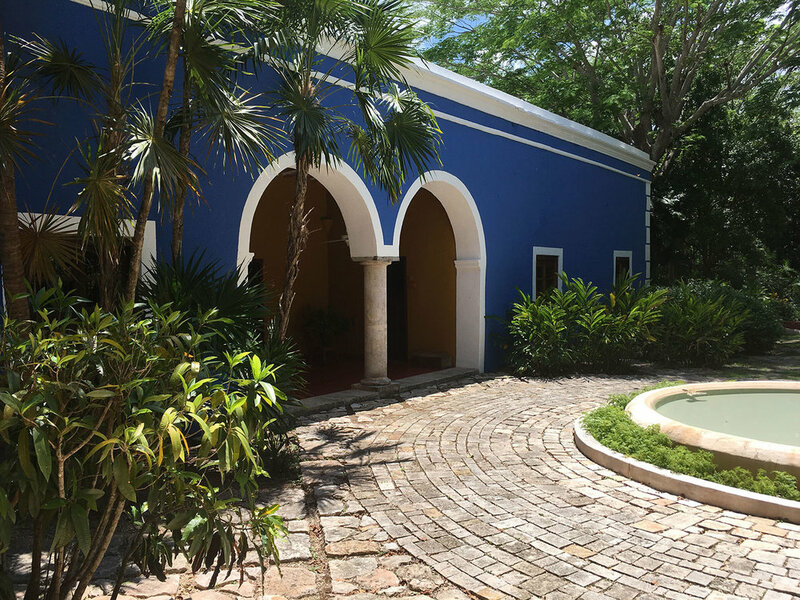 And when going around the estate, we realised that it shows two styles: one from the livestock period and the other from the henequén crop, a common sequel of Yucatán haciendas. In addition, many ancient Maya stone artifacts are displayed in the garden grounds, some small sculptures and a lot of stone hultúns for collecting water. Our guide Felipe, although a Maya himself, was not able to tell us what ancient Maya city this land belonged to in the past (which always interests me). Since then I have found out that the hacienda sits in a region that was known as La Costa when it was formed by the Mayan chiefdoms Cehpech, to the west, and Ah Kinchel, to the east. The former belonged to the ancient towns of Tixkokob, Euán and Cacalchén, whose lands adjoin the San José Cholul estate. 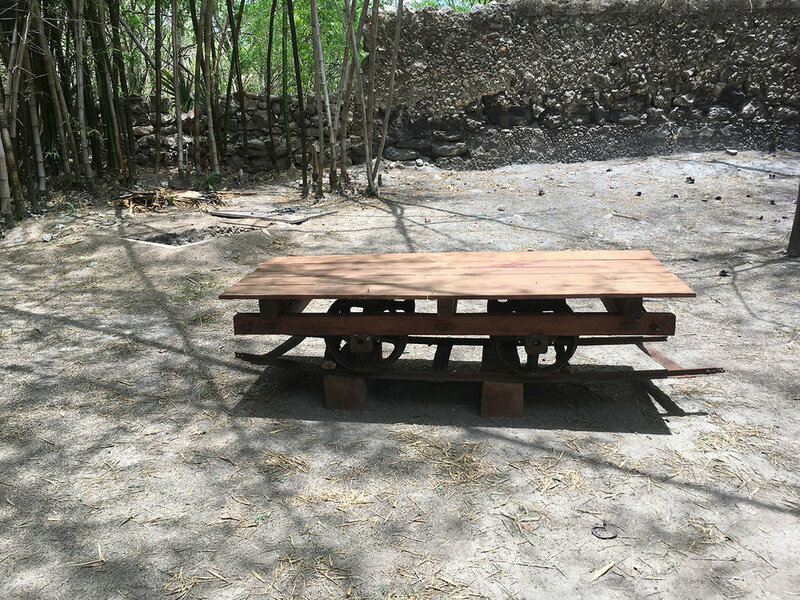 The ancient hultúns for collecting water and the train wheels. Two pieces of different lives on this land: ancient and colonial. As for the first Spanish ownership, the lands of San José Cholul were granted to none other than Francisco Montejo, who came to these lands to conquer them. Our guide Felipe told us so very proudly but it is only partially true, because back then San José Cholul was part of two old encomiendas: Cacalchén was given in 1549 to José Ventura de Magaña and Figueroa, and Tixkokob was granted to Francisco de Montejo and later to Martín de Palomar (see the map at the end of my post). Encomienda was a grant by the Spanish Crown to a colonist, giving the right to demand tribute and forced labour from the Indian inhabitants. San José Cholul was named after its holy patron, San José. Cholul was a common naming system for haciendas back then. The main house and the chapel. The old factory has been turned into a restaurant. 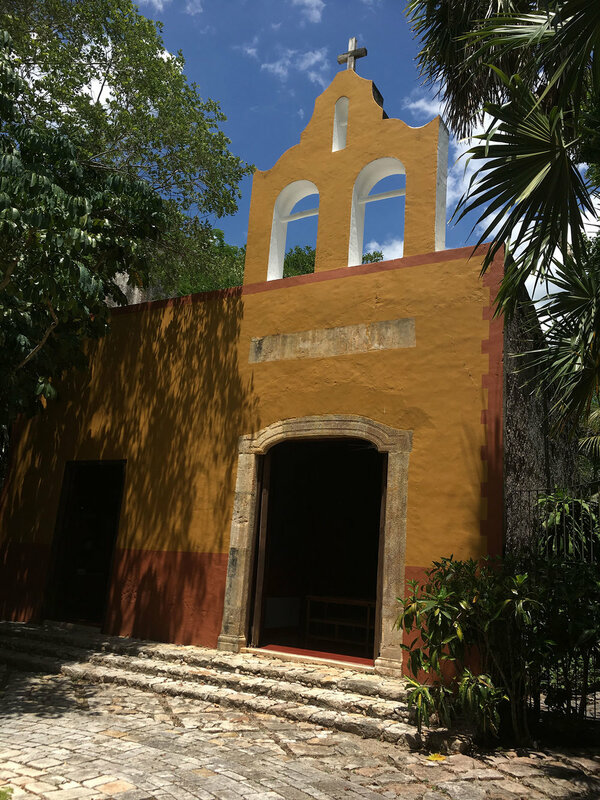 Haciendas are a distinctive part of the Yucatán landscape and cultural heritage. San José Cholul is no exception. I have described the history of Yucatán haciendas in my other hacienda posts but it may be worth saying that they emerged here later than in the rest of Mexico where such agricultural estates were established almost immediately after the conquest and during the seventeenth century. In Yucatán it took longer because of the poor quality of the soil and the lack of water to irrigate. In the 18th century San José Cholul focused on livestock and corn, fruit tree orchards, and sugar cane (imported here by the Spaniards). From the sugar cane, only brown sugar and brandy were produced for domestic consumption. The old chimney that was used for these purposes is still standing. Each henequen hacienda had its signature chimney. The hacienda changed hands many times from then on. In 1879 Antonino Bolio Guzmán introduced the first henequén shredder plant, which consisted of a scraper wheel powered by a steam engine. In 1889 he inaugurated a tram route of three kilometres, which started from his farm Chacmoltén and ended at San José Cholul farm. From there, the rail network in Yucatán was so dense that there was no problem to deliver the sisal bales to Sisal port north-west of Mérida and then export them abroad. In 1904, Mr. Bolio Guzman sold the hacienda and its annexes to two of his sons who, by 1916, had managed to increase the property substantially, by adding Chacmoltún, Tepakán, Xtohil and Habín. Haciendas used a narrow gauge railway system. The hacienda was badly damaged before restoration took place. 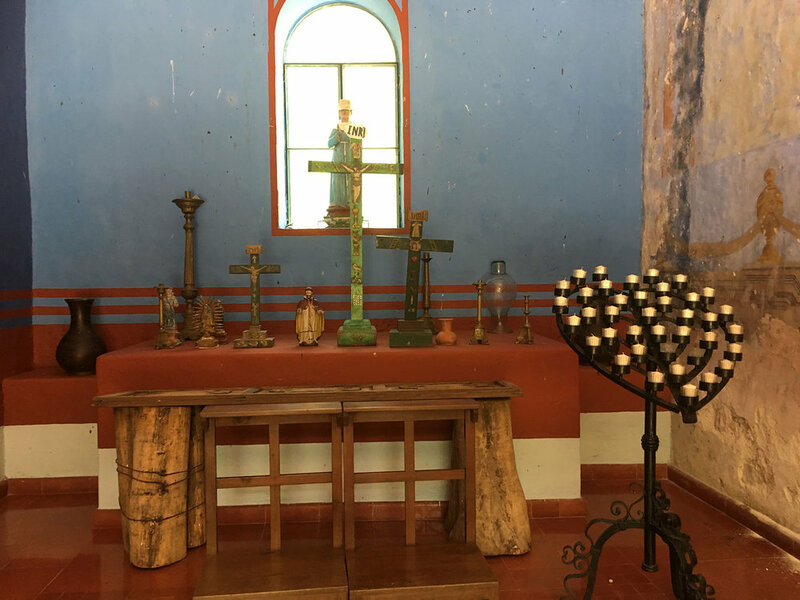 Photos taken at the hacienda chapel. The Agrarian Reform in the 1940s by president Lázaro Cárdenas brought a big change: the hacienda properties were handed over to the peóns of the estates. Back to the original owners of the land!!! The hacienda owners were allowed to keep a limited number of hectares and that is why it is now not a large estate. In 1944 the San José Cholul ranch became the property of Elba G. Cantón de Basares with only 15 hectares. In 1963, Nacional Financiera, a bank owned by the Mexican government, was awarded the property, which in just over thirty years had become ruins. Photos from the hacienda wall display. When you decide to come here and take a tour, try to 'spot' the history from the architecture. The entire maize-livestock period can still be recognized. The façade of the main house faced south and was protected by a traditional roofed corridor with a structure of wood and straw. To the west of the house were the water wheel, the garden and a water tank with the irrigation system, shared by the main house, the church and the nearest gardens. I have been to many haciendas in Yucatán but I have not seen such a well-preserved irrigation system anywhere else. To the north of the main house, the kitchen, the pantry and the stables were built of stone. The 'sugar house' and its chimney were built nearby as the distillation was done very close to the chimney and the water wheel. The chimney by the kitchen can be seen from the restaurant. The old irrigation system from the times of the cattle ranch. Rhod with our guide Felipe. The main house was enlarged at the end of the 19th century, due to the henequén boom. The wooden arcade of the façade of the main house was replaced by bah-pec (lime and stone). When it was restored in the 1980s to be qualified as a hotel, the large irrigation tank was transformed into an elegant pool, which is perhaps the landmark of the hacienda today. There is another pool for guests, also built from the irrigation tank, which was on an elevated level. You can see the well feeding it by each pool. The second pool behind the main house. The old irrigation channel by the pool. The stone walls behind the main house give the place a rustic feel. Some buildings retain the original doors and window frames. The 18th century murals were also restored in the chapel and the buildings have preserved their decoration and furnishings, and even the striking pastel blue of the façades. The restored original murals of the hacienda. All in all, a visual feast and a step back to interesting colonial times. And did I mention the tranquillity and the beautiful jungle gardens? You will be able to spot a few spiky blue-green plants of henequén and you can feast your eyes on many tropical trees and plants, mostly palms, majestic ceiba trees (the sacred Maya tree), bougainvillea, plumerias (known here as 'flor de mayo'), ramón (breadnut) and orange trees. Just outside the restaurant is a majestic elephant-ear tree, also known as guanacaste. The seedpods look truly like elephant ears and in Mexico they are eaten boiled (while they are still green). And the cattle and horses also relish them. The guanacaste tree (elephant-ear tree). The seeds do remind you of elephant ears. 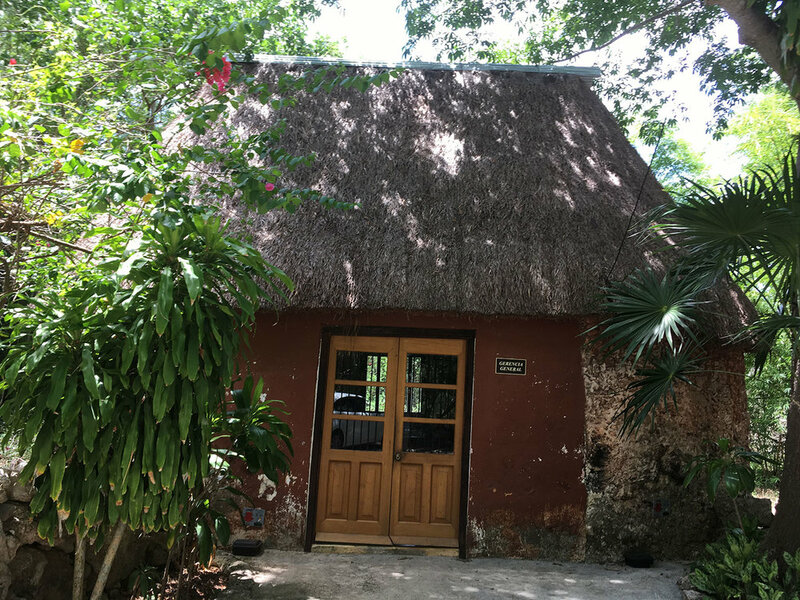 The hacienda is situated in the little town of Tixkokob, 45 minutes from Merida. Don't make the same mistake as we did. We arrived here from the town of Motul just a few km north of the hacienda. We were at the cenote Sambulá in Motul and a local advised us to take the dirt road which starts at the back of the cenote. Yes, it was only a few km, but a very narrow path. So much so that the jungle trees were scrubbing against the car and we had to go VERY slowly. 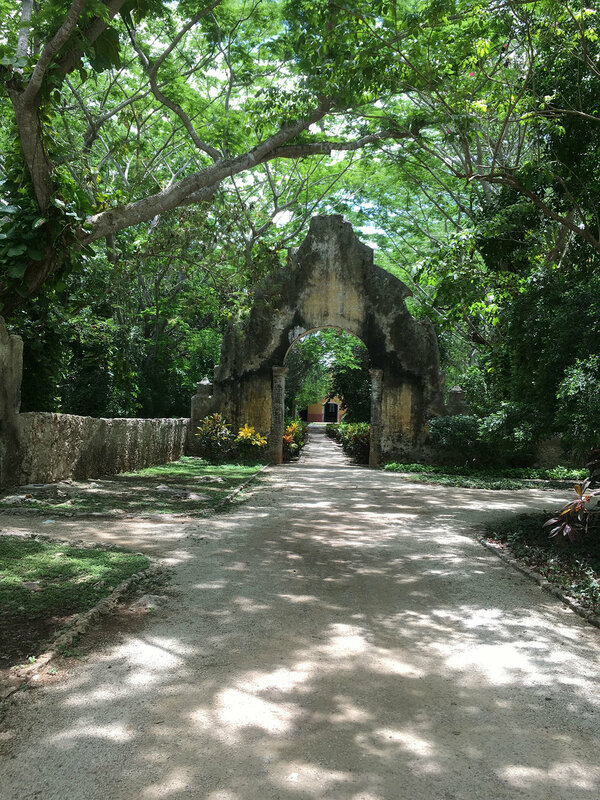 We then came to the back wall and the back entrance of the hacienda and had to make a circular journey to the main entrance. The entry gate from the car park. The access road that you will reach from Tixcokob or Cacalchén. The management house at the car park. We combined the hacienda with a visit to the town of Motul, just a few km north of the hacienda. There we also visited the cenote Sambulá. Another option is to go further north to the seaside town of Telchac, where you can visit the ruins of Xcambó and the pink lakes called Xtampú Salinas.